Aspen is one of Colorado's favorite year-round resort areas. One will not be at a loss for activities ranging from recreation to the arts to culinary delights. Aspen sits at the upper end of the Roaring Fork Valley, with the Roaring Fork River, a superb trout stream, running through town. It offers an interesting history, challenging outdoor recreation opportunities, abundant cultural activities, pleasant climate and beautiful natural scenery. Aspen is world renowned for its downhill skiing. Aspen Mountain rises imposingly from town and is one of four ski areas in the valley. Aspen brings the arts and culture of the big city to you sans the honking horns. Winter and summer calendars are chock full of events from the world renowned ballet and music for all tastes, to art openings and lectures by talented individuals from all over the world, and even some from our own backyard. The Aspen Ideas Festival is a world-renowned gathering of some of the brightest and most innovative minds in the world, the FOOD & WINE Classic in Aspen has become an iconic Aspen event, Jazz Aspen Snowmass continues to draw the biggest acts in the music world, the Aspen Art Museum is a globally recognized leader in contemporary art, the Aspen Santa Fe Ballet annually garners rave reviews, Theatre Aspen pulls the curtain on a terrific playbill every year; and that is just the tip of the iceberg. With more restaurants than in recent years - well over 100 - old favorites mesh with fresh menus and new talent to provide enough culinary options to please any palate. Travel by dog sled, sleigh, SnoCat or gondola in the winter or simply dine al fresco any time of year on one of our many outdoor patios. For any meal of the day there is a restaurant, coffee shop, lounge or deli that can fill your cravings -- you'll be at a favorite spot before you know it. 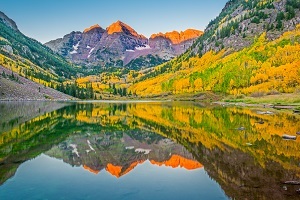 Aspen offers hiking around the Maroon Bells, which is the most photographed peaks in North America are the perfect Rocky Mountain backdrop for a hike, picnic, or overnight excursion. Discovering downtown shops near the Dancing Fountain where both children and adults delight in the dancing waters of the Hyman Avenue Fountain. Taking a ride up the Silver Queen Gondola to the top of Aspen Mountain for spectacular views, delicious food, free classical and bluegrass music (weekends only), kids' activities, disc golf and miles of trails to hike and bike. Then taking a drive up Independence Pass, east of Aspen, along the winding, two-lane Highway 82. Favorite stops include the Grottos ice caves, the Devil's Punchbowl, Independence Ghost Town, hiking trails and the continental divide at the top of the pass. You can bike or walk on the Rio Grande Trail. Rio Grande is Aspen's can't miss trail for visitors looking to enjoy their surroundings. The "Rio" follows the Roaring Fork River all the way to Glenwood Springs. The ride or walk possibilities are endless. If you can't make it the whole way, stop at the Woody Creek Tavern to refuel for your walk/ride back into town! When hiking the Hunter Creek Loop: at the northern end of Aspen, a favorite trail amongst locals looking for a quick nature fix. The trail winds along a mellow creek, through dense aspen groves and meadows with blooming wildflowers, go as far as you want or complete the loop by coming down the Smuggler Mountain Road. Aspen offers a completely free bus system in town and to the neighboring town of Snowmass. Additionally we have the Aspen Airport- Sardy Field offering multiple flights daily. Aspen Valley Hospital (AVH) is a twenty-five bed community hospital that represents the best of two worlds – the warmth and friendliness of a small town, and the technical expertise of a major medical center. Additionally we have various small clinics ranging from orthopedic to dentistry to woman's health. Jan 7.4 F° 20.7 F° 34.0 F° 1.7 "
Feb 11.2 F° 25.1 F° 38.9 F° 2.1 "
Mar 18.8 F° 31.7 F° 44.6 F° 2.7 "
Apr 24.8 F° 37.9 F° 51.0 F° 2.6 "
May 33.5 F° 47.4 F° 61.3 F° 2.1 "
Jun 40.6 F° 56.4 F° 72.1 F° 1.3 "
Jul 46.2 F° 61.7 F° 77.2 F° 1.8 "
Aug 45.6 F° 60.5 F° 75.4 F° 1.4 "
Sep 38.6 F° 53.5 F° 68.5 F° 1.7 "
Oct 29.1 F° 43.4 F° 57.7 F° 2.1 "
Nov 17.0 F° 29.8 F° 42.5 F° 2.2 "
Dec 8.6 F° 21.7 F° 34.8 F° 1.8 "
Spring in Aspen is short & sweet. You can experience spring ski days in March & April, enjoying warmer temps and goggle tans and sunny apres ski. Summer, a season not to be missed in Aspen. "I came for the winter, and stayed for the summer." Is a phrase you'll hear often around town. The weather is one of the highlights, during the day the temperature hovers in the 70's and 80's, and by evening the mercury will drop into the 60's. People of all ages will appreciate the utter lack of humidity, making Aspen one of the places you can always have a good hair day. Fall is one of the most spectacular times of the year in Aspen, days are filled with sunshine and autumn warmth. Valleys full of aspen trees turn yellow against a crystal clear blue sky. You really can't go wrong with a visit to Aspen in September and early October. Winter, the renowned season for Aspen. Skiing and Snowboarding on these world-class slopes should be on everyone's bucket list, but the fun doesn't stop when the chairlift stops running in the evening. Home care Senior center Visiting nurses Pitkin County offers a Meals on Wheels like program and a Senior center which offers free meals to 60+ Seniors. Additionally we have social groups such as Elks Club and Eagles Club. Additionally Pitkin County Senior Services offers a variety of activities and services for residents and guests of our community age 60 and over. These include: After-lunch entertainment and educational programs, Bike, snowshoe and cross country,and downhill ski outings, Community events, Computer corner, Exercise and Wellness classes, Lunches 3 days per week, Overnight trips, Referrals for many types of assistance, Support groups, Transportation. There are numerous amount of opportunities for senior to volunteer, Food & Wine Classic, Aspen Hospital and the many non-profits in the area.